This guide builds walks through the steps required to display information on an org chart that is created from a custom list. The process of setting up an organization chart from a custom list is described here. If you use a custom list to create an organisation chart there are some additional steps that must be completed in order for the chart to be able to display the information that your require. In this example the page author wishes to create an organisation chart from a custom list named SimpleOrgChart that has the fields Title, Person ID, Manager and picture. 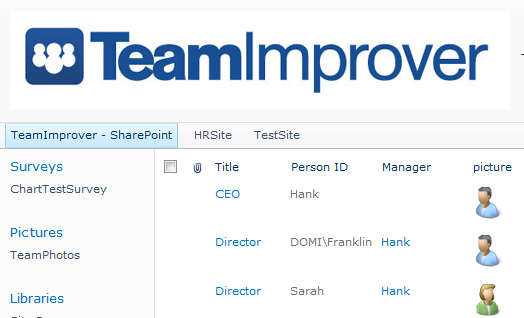 The page author has selected SharePoint List as the data source, Person ID as the primary key, Manager as the manager field and SimpleOrgChart as the name of the list. Upon apply the properties the structure of the organisation chart can be seen. However because this is a custom list the information within the boxes is not displayed. This is becase the SharePoint Org Chart has not worked out which fields the end user would like to see. A useful tip at this stage is to turn on the Debug Mode that can be found at the bottom of the Troubleshooting property section. This will display additional information. Within this is a section labeled Available Fields this is a list of the fields available to use in the SharePoint Org Chart. The page author now completes the configuration by opening the Chart Items configuration section and placing the value Picture in the Picture Column property. 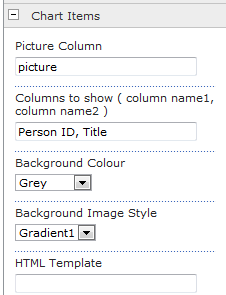 This tells the web part which field contains the picture. But could have used any of the fields contained in the list and shown in the Available Fields information section. After applying these properties the organisation chart will display the correct information and the configuration is complete.